Venezuela's government and opposition have reached a deal on foreign aid as part of a Vatican-backed dialogue process to try to stem an escalating crisis of extensive shortages, soaring inflation and mass protests in the Caribbean nation. The agreements reached on Nov. 12, however, fell far short of initial opposition demands and there will be no early elections, said President Nicolás Maduro, AFP reports. "An electoral way out? Way out to where?" Maduro said on his weekly television program. "Nobody should get obsessed with electoral processes that are not in the constitution." He spoke a day after his socialist government and the opposition agreed on a "road map" for dialogues to mollify a volatile situation. No reference to early elections was made in the joint statement issued at the end of the Vatican-supported talks, but leaders of the main opposition coalition depicted it as easing the way to elections as a solution to the political impasse. Maduro's allies will consider allowing foreign donors provide food and medicine to the crisis-hit country and work toward naming new directors to the national elections authority, which the opposition says favors Maduro, Reuters news agency reported. "We agree to promote respectful political action," said ruling Socialist Party Director Jorge Rodriguez, reading from a conciliatory joint statement agreed to by both sides. "The common good is above our legitimate differences." The steady decay of the oil-rich nation's economy and a growing political standoff over a referendum on Maduro's rule led both the Vatican and U.S. diplomats in late October to facilitate a dialogue. The two sides will meet again on Dec. 6 despite the opposition's pledge to stay away from the talks if the government did not set in motion a recall referendum on Maduro's rule and release more than 100 jailed opposition activists. They will work together to name two new members to the five-member elections board, which in November thwarted an opposition recall effort and escalated the political standoff that has paralyzed Venezuela. The government allowing foreign assistance effectively acknowledges the dire situation in Venezuela, where millions are struggling to eat three meals a day. 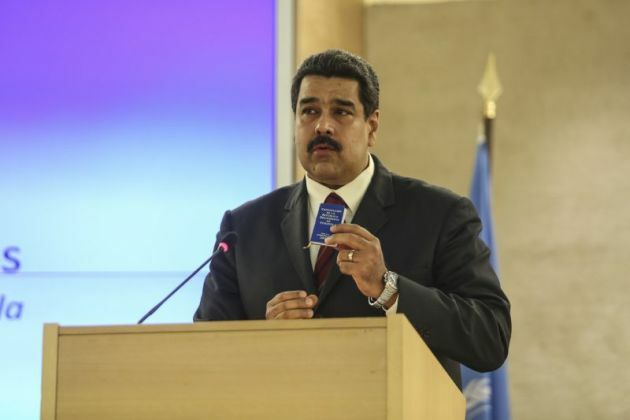 Maduro has accused capitalist groups backed by the United States for the current crisis. The opposition says it is 17 years of socialist rule under the president and his late predecessor, Hugo Chávez that has crippled the nation. In a report on Oct. 24 Human Rights Watch says that under the leadership of President Chávez and now President Maduro, the accumulation of power in the executive branch and erosion of human rights guarantees have "enabled the government to intimidate, censor, and prosecute its critics, leading to increasing levels of self-censorship." "Police abuse, poor prison conditions, and impunity for security forces when they commit such abuses as arbitrary arrests, beatings, and denial of basic due process remain serious problems. Other concerns include lack of access to basic medicines and supplies - the result of problematic government policies."